This statement was originally published as: Osteoporosis Prevention, Diagnosis, and Therapy. NIH Consens Statement 2000 March 27-29; 17(1): 1-36. For making bibliographic reference to consensus statement no. 111 in the electronic form displayed here, it is recommended that the following format be used: Osteoporosis Prevention, Diagnosis, and Therapy. NIH Consens Statement Online 2000 March 27-29; [cited year, month, day]; 17(1): 1-36. What is osteoporosis and what are its consequences? How do risks vary among different segments of the population? What factors are involved in building and maintaining skeletal health throughout life? What is the optimal evaluation and treatment of osteoporosis and fractures? The goals for the evaluation of patients at risk for osteoporosis are to establish the diagnosis of osteoporosis on the basis of assessment of bone mass, to establish the fracture risk, and to make decisions regarding the needs for instituting therapy. A history and physical examination are essential in evaluating fracture risks and should include assessment for loss of height and change in posture . Laboratory evaluation for secondary causes of osteoporosis should be considered when osteoporosis is diagnosed. The most commonly used measurement to diagnose osteoporosis and predict fracture risk is based on assessment of BMD which is principally determined by the mineral content of bone. BMD measurements have been shown to correlate strongly with load-bearing capacity of the hip and spine and with the risk of fracture. Several different techniques have been developed to assess BMD at multiple skeletal sites including the peripheral skeleton, hip, and spine. The World Health Organization (WHO) has selected BMD measurements to establish criteria for the diagnosis of osteoporosis. A T-score is defined as the number of standard deviations (SD) above or below the average BMD value for young healthy white women. This should be distinguished from a Z-score, which is defined as the number of SD above or below the average BMD for age- and gender-matched controls. 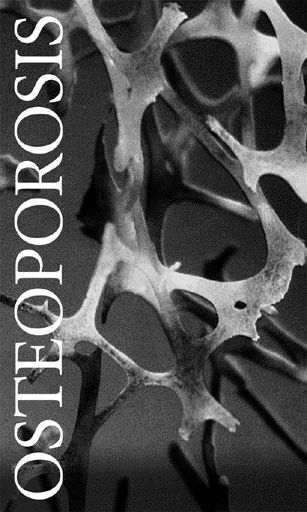 According to the WHO definition, osteoporosis is present when the T-score is at least minus 2.5 SD. Although T-scores were based originally on assessment of BMD at the hip by dual-energy X-ray absorptiometry (DXA), they have been applied to define diagnostic thresholds at other skeletal sites and for other technologies. Experts have expressed concern that this approach may not produce comparable data between sites and techniques. Of the various sampling sites, measurements of BMD made at the hip predict hip fracture better than measurements made at other sites while BMD measurement at the spine predicts spine fracture better than measures at other sites. In addition to the effects of bone mass, bone micro architecture, and macrogeometry, bone strength is also affected by the rate of bone remodeling. Bone remodeling can be assessed by the measurement of surrogate markers of bone turnover in the blood or urine. These markers include bone-specific alkaline phosphatase and osteocalcin, which are indices of bone formation, and the urinary levels of pyridinolines and deoxypyridinolines and serum and urine levels of type I collagen telopeptides (CTX and NTX), which are indices of bone resorption. The level of these markers may identify changes in bone remodeling within a relatively short time interval (several days to months) before changes in BMD can be detected. However, according to available data, marker levels do not predict bone mass or fracture risk and are only weakly associated with changes in bone mass. Therefore, they are of limited utility in the clinical evaluation of individual patients. Despite these limitations, markers have been shown in research studies to correlate with changes in indices of bone remodeling and may provide insights into mechanisms of bone loss. What Are the Effective Medical Treatments? Should the Response to Treatment Be Monitored? Genetic factors leading to osteoporosis are being identified. These factors may relate to bone mass acquisition, bone remodeling, or bone structure. Pharmacogenetic approaches for identifying and targeting specific genetic factors predisposing to osteoporosis need to be developed. Glucocorticoid use is a common cause of secondary osteoporosis and associated fractures. What is the impact of glucocorticoid-induced osteoporosis in adults and children? What are the mechanisms of disease? What novel approaches can be taken to stimulate bone formation in this condition? Development of glucocorticoids that avoid effects on the skeleton are needed. Secondary causes of osteoporosis are prevalent. A number of risk factors have been identified, including specific disease states and medication use. How should patients be identified for diagnosis and treatment of osteoporosis? What is known about the use of bisphosphonates or other agents in young adults with secondary osteoporosis? What is known about the causes of osteoporosis in perimenopausal women? How should they be monitored for treatment response? Are therapies for improving bone mass in postmenopausal women effective in secondary causes? There is a need for prospective studies of gender, age, and ethnically diverse individuals to provide data that will permit more accurate fracture risk identification in these populations. Fracture risk is a combination of bone-dependent and bone-independent factors. Bone-independent factors include muscle function and cognition, which also contribute to falls leading to fractures. A comprehensive assessment of bone-dependent and bone-independent factors should be included. There is a need for a comprehensive assessment of a validated risk assessment tool. What is the best way to identify patients in need of treatment for osteoporosis? An algorithm should be constructed that incorporates risk factors for fracture in addition to assessment of bone density. What is the best use of surrogate markers of bone turnover to determine osteoporosis, and how does this impact on fracture risks? Quality of life is significantly impaired by osteoporosis. Future research should characterize and validate quality-of-life tools in patients across gender, age, and race or ethnicity. It will be important to identify effects of fracture risk and intervention on quality of life. Quality of life should be incorporated as an outcome in clinical trials evaluating fracture risk and therapy. In addition, the psychosocial and financial effects of osteoporosis on caregivers and family dynamics should be considered. There are no available data to suggest which asymptomatic patients should have screening bone-density tests done or when screening is justified. Information regarding screening guidelines is important to obtain. Neuropsychiatric disorders may cause or be the result of osteoporosis. Specific psychiatric disorders, including depression and anorexia nervosa, are associated with osteoporosis or clinical fractures. Medications used to treat psychiatric or neurologic disorders may cause osteoporosis, and the diagnosis of osteoporosis may have psychological implications. Research efforts into the relationship between neuropsychiatric disorders and fracture risk should be strongly encouraged. What is the optimal evaluation and management of fractures? What diagnostic and management paradigm should be employed? What are the long-term consequences of osteoporosis and clinical fractures on nonskeletal body systems? What measures can be taken to prevent subsequent fractures? Anabolic agents that stimulate bone formation, such as PTH and fluoride, have been evaluated. Meta-analysis of fluoride therapy revealed no protective effects on fracture risk. PTH peptides are the most promising but are still in clinical trials. Other factors, including growth hormones, are under investigation. There is a critical need to develop and assess anabolic agents that stimulate bone formation. Assure accessibility to treatment for people regardless of income and geography. There is a need to determine the most effective method of educating the public and health care professionals about the prevention, diagnosis and treatment of osteoporosis. There is a need to improve the reporting of BMD and fracture risk so it is understandable to medical specialists and can be explained to patients. Study is needed to determine the efficacy and safety of long-term administration of various drug interventions in maintaining BMD and preventing fractures. Trials of dietary supplements are needed. Study is needed to understand the influence of nutrition on micronutrients and non-patentable medical interventions. Study is needed to understand cost-effectiveness and effectiveness of programs encouraging bone health. Study of interventions examining the long-term effects of fractures on health, function and quality of life is needed. Osteoporosis occurs in all populations and at all ages. Though more prevalent in white postmenopausal females, it often goes unrecognized in other populations. Osteoporosis is a devastating disorder with significant physical, psychosocial, and financial consequences. The risks for osteoporosis, as reflected by low bone density, and the risks for fracture overlap but are not identical. More attention should be paid to skeletal health in persons with conditions known to be associated with secondary osteoporosis. Clinical risk factors have an important, but as yet poorly validated, role in determining who should have BMD measurement, in assessing risk of fracture, and in determining who should be treated. Adequate calcium and vitamin D intake are crucial to develop optimal peak bone mass and to preserve bone mass throughout life. Supplementation of these two components in bioavailable forms may be necessary in individuals who do not achieve recommended intake from dietary sources. Gonadal steroids are important determinants of peak and lifetime bone mass in men, women, and children. Regular exercise, especially resistance and high-impact activities, contributes to development of high peak bone mass and may reduce the risk of falls in older individuals. Assessment of bone mass, identification of fracture risk, and determination of who should be treated are the optimal goals when evaluating patients for osteoporosis. Fracture prevention is the primary goal in the treatment of patients with osteoporosis. Several treatments have been shown to reduce the risk of osteoporotic fractures. These include therapies that enhance bone mass and reduce risk or consequences of falls. Adults with vertebral, rib, hip, or distal forearm fractures should be evaluated for the presence of osteoporosis and given appropriate therapy.